Don't diet, get nutritionally wealthy! Quiz: Are you in nutritional debt? Get your free customized results! By Catherine on December 2, 2013 | Last Updated April 4, 2016 | 24 Comments | Medical Disclaimer | This Post Contains Affiliate Links - I may receive a commission if you purchase through links in this post. 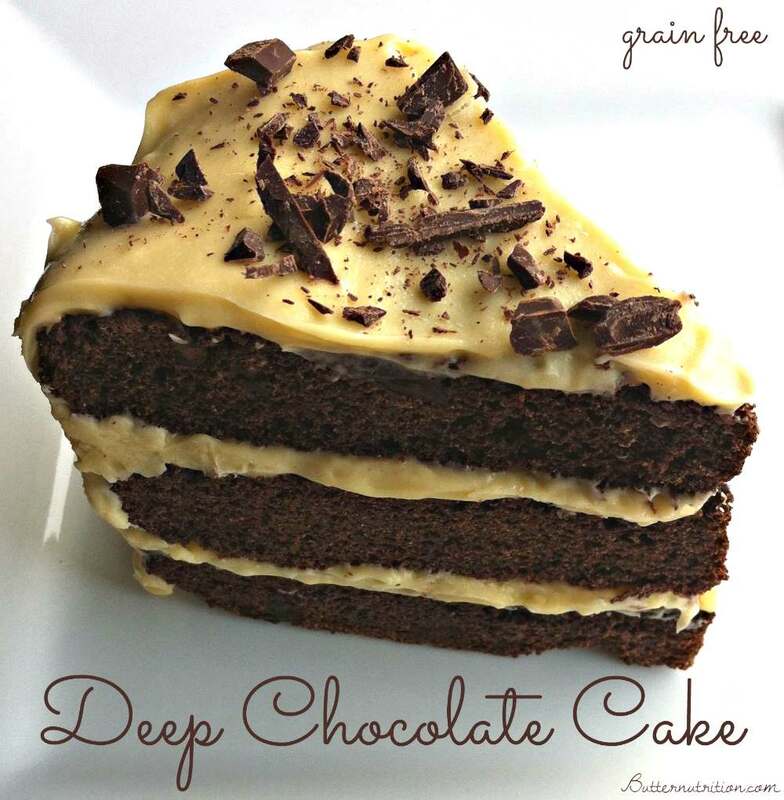 This gluten free chocolate cake is made with three kinds of chocolate: cacao powder, cocoa butter and chocolate chips! 1) In a bowl mix together coconut flour, cocoa powder, gelatin, salt & baking soda. 2) Melt cocoa butter & honey over low heat. Add vanilla & simple syrup, and then pour and mix with flour mixture (the simple syrup is made from bringing 1.5 cups cane sugar and 1 cup water to a boil, and then let dissolve and cool). 3) In a separate bowl crack eggs and beat using a fork. 4) Add eggs to batter and stir. Then add the chocolate chips. Batter may appear slightly thin but will thicken slightly. 5) Grease springform pan with butter, or desired baking pan. This recipe makes approx 1 layer. 6) Bake at 350 degrees for about 28-32 minutes or until a toothpick comes out clean. 7) If making a layer cake, make sure to trim each layer to ensure they are flat and stackable. 1) Melt cocoa butter ever so slightly (just liquid, not hot or warm). Add room temperature butter, honey and vanilla. 2) Mix with a hand mixer until combined. If the frosting won’t set up nicely, it’s probably too warm. Let cool for a few minutes in the fridge and try whipping again. 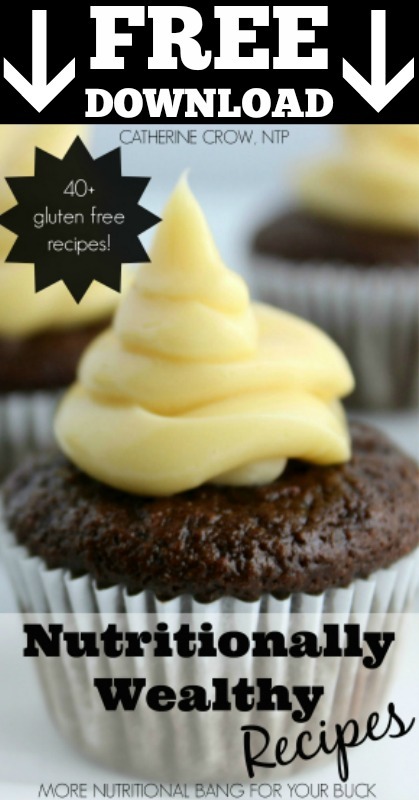 Don't Diet, Start Getting Nutritionally Wealthy With This FREE Recipe eBook! Affiliate Link Disclosure: This post contains affiliate links. We are a participant in the Amazon Services LLC Associates Program, an affiliate advertising program designed to provide a means for us to earn fees by linking to Amazon.com and affiliated sites. Please note: using an affiliate link does not change the price of the product, instead the seller pays Butter Nutrition a small commission. My thoughts on these products are my own. The cake recipe does not have butter in it but the cake instructions say “melt butter, honey, and coconut oil over low heat and add vanilla extract. Then pour and mix with flour mixture.” Also the cake ingredients show “1/2 cup simple syrup” but the cake instructions do not use that ingredient. Cake looks great and I would like to make it, but am unsure of the instructions. Thank you. Melt the “butter” refers to melting the cocoa butter 😉 And I will update the when to add the simple syrup. Thanks for correcting me! Am I missing where you explain how to make simple syrup? How do you make your simple syrup? This looks great and I would love to try it, but I have sensitivity to honey and just about all artificial sweeteners. Would maple syrup or extra of the simple syrup work to replace it? I would try using maple syrup in place of the honey. Simple syrup has a little higher water content, so best to keep that as is! Can you use coconut sugar instead of the cane sugar? Could you use coconut sugar to make the simple syrup instead of cane sugar? Loving this recipe but before I attempt, can the hot-soluable gelatin be substituted for the cold-soluable gelatin? Also, any substitution for the cocoa butter? Is there something I could substitute the gelatin with? I do have gelatin but the red canned one :S. thank you for your recipe, can’t wait to make it! What does the 2 tb gelatin collagen hydrolysate in the recipe do? I don’t have it (I only have the one in the orange canister, which I know cannot be substituted in here). Does the amount of butter crème frosting shown in the recipe just enough to accommodate the single layer cake referenced in the recipe, or is it enough for a two-layer cake as shown in the photo? How do you measure the cocoa butter if you just have it in a big block? Do you have weights instead of volume for this recipe? Please answer my question soon bc I really want to make this cake for a loved one’s birthday later this week. I would really appreciate it! I melt the cocoa butter and then measure. Can something be substituted for the simple syrup like additional honey? Trying to stay away from cane and other sugars. I’d like to make this over the weekend so a prompt reply is appreciated. Thanks! Shopping for this cake right now and can’t find food grade cocoa butter any where. No time to order it. I need a substitute ASAP. This looks wonderful but I won’t touch sugar in any form. My idea would be to sub water for the simple syrup…things are usually too sweet anyhow? Also, do I have to buy a $22 bottle of gelatin collagen or can I just use gelatin from Whole Foods? I highly recommend not to make this without the sugar. It will not turn out at all. I ditto the question above…is the frosting in recipe for one layer or more? Thanks!! 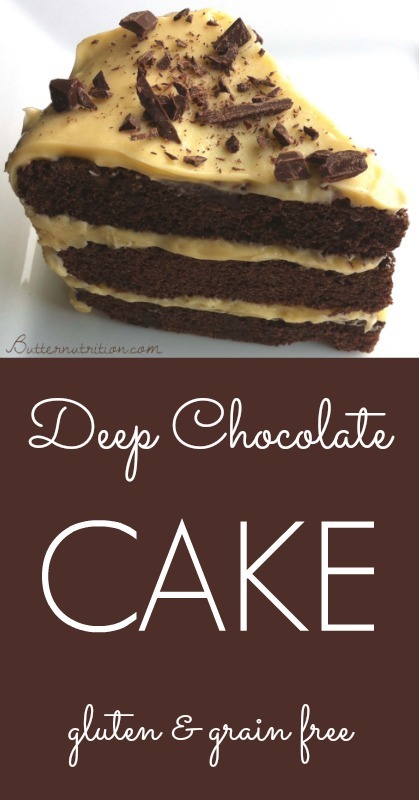 I just made this last night – the frosting is great for one layer. I doubled it for the second layer. Join 40,000+ Subscribers Saying Goodbye To Their Nutritional Debt! Don't Diet, Get Nutritionally Wealthy! Discover how to use food to fuel and transform your life with whole food therapy. Your abundant life is waiting for you! Connect with me at Facebook, Pinterest, Instagram, or get email updates to stay in the loop!